Acute Bronchitis is an infection of the bronchial tubes that are connected to the lungs. It often follows the cold or flu virus when one's immune system is weakened and the lungs are irritated. This usually improves within a few weeks without lasting effects, although you may continue to cough for a couple of weeks. Chronic bronchitis on the other hand, requires medical attention. • Bronchitis can make you feel extremely tired; hence it's important that you get plenty of rest as your lungs need to heal. Avoid exercising during this period as it can worsen the lung infection. • Drink only warm fluids. This can help soothe your throat and keep the phlegm loose which becomes easier to expel. 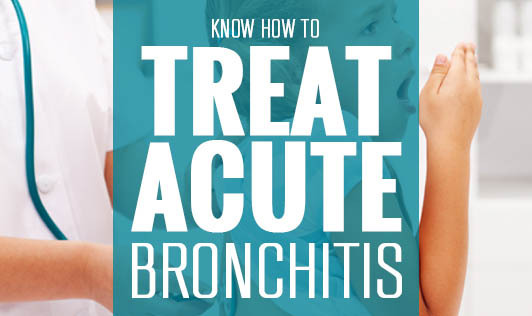 • Bronchitis can make your lungs feel heavy when you cough frequently. You can use a hot compress on your chest to ease the pressure. • Hydrating your lungs with warm, moist air can soothe the bronchial passageways. You can use a humidifier or boil a pot of water and the steam produced from it can increase the room's humidity. • Avoid smoke and other lung irritants as it can delay the healing process.